Block Party is a crazily addictive, stylish and easy to learn puzzle game for iOS. 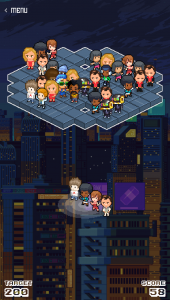 Your objective is to put on the best pixel parties New York has ever seen. Build your reputation for the best get downs in the city, to complete every level from Manhattan to The Bronx. The gameplay is simple but highly addicting. You start with an empty dance floor, and it’s your job to place partygoers strategically to make lines – which clears space for more. 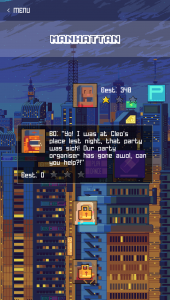 Get enough revellers into your epic party, and the level is complete. 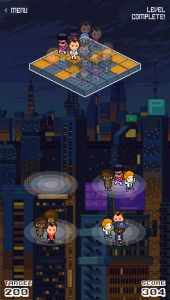 As you complete levels your rep will grow and the parties will get crazier – and harder! Block Party is a stylish and unique take on the casual puzzle game, with amazing graphics from pixel artists such as Cocefi and Kirokaze, and music from Kick Lee and Katrina Stone amongst others. Don’t forget to visit the Pixamo Rewards section, as completing tasks in Block Party will earn rewards in other Pixamo games and level up your Pixamo Rank.